Scott King’s artworks are infused with a cunning media savviness that deftly navigates between product, messaging, and desire. 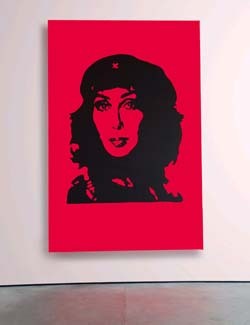 Reminiscent of Warhol’s screen print portraits, with all of their commodified garishness, King’s Cher stands in for counter-culture hero Che Guevera, a rebel-icon and its lost meaning, long dissipated by mass reproduction. 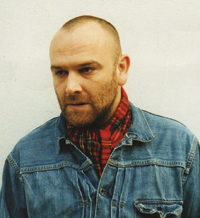 Emblazoned in acid-house pink, left-wing radicalism becomes fused with celebrity obsession, a contemporary by-product of cultural dysmorphia. Nostalgic of the politicised youth of Thatcher’s Britain, now recaptured and packaged as fashion, King posits contemporary insurgency as homogenised consumer choice.